This page is to celebrate the media highlights of patients Dr. Graham has cared for over the years and for the success of the schools he supports with medical coverage and support. 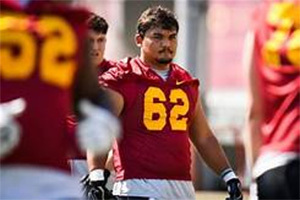 USC offensive lineman Brett Neilon get his first start at center this weekend! Great story about his upbringing in Japan and only becoming a football player as a SMCHS freshman! 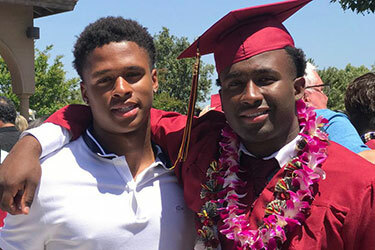 Learn about true freshman Abdul-Malik and his soon to be USC freshman brother Munir from Santa Margarita and J Serra High School football programs. They are soon going to be members of the Trojan Football Family. Their mother Shan has some wisdom to share about being a parent of exceptional athletes. Dominique Ruotolo finishes first in both the long jump and triple jump in the CIS-SS Masters Meet just after her high school graduation ceremony! Mater Dei's Dominique Ruotolo started her Saturday by wearing a cap and gown and being awarded her high school diploma. 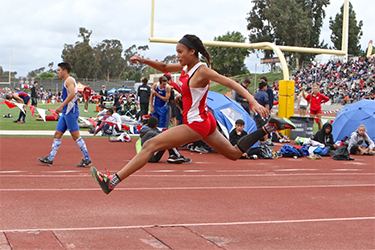 Ruotolo, who had to leave Mater Dei’s commencement ceremony early in order to make it to the meet on time, finished first in the long jump and triple jump, hitting distances of 19-feet, 2-1/2 inches and 41 feet, ½ inch, respectively. 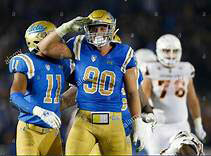 Johnny Stanton is in invited to Minnesota Vikings Camp! What a blessing this weekend has been. 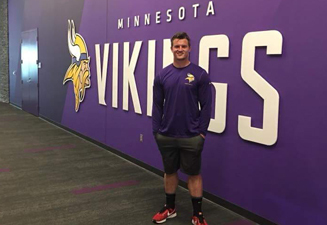 I was one of 31 guys invited by the Vikings to tryout for their 90-man camp roster. Through hard work and God’s Grace, I signed a contract with Minnesota and I am now able to call myself a Viking. Here’s to competing at the next level! 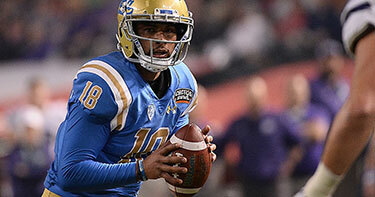 Mater Dei standout Quentin Lake is making it happen at UCLA. Last season, Quentin was routinely among the last UCLA players to depart the practice field. He would linger for extra work pushing a tackling sled or perfecting the technique that he hoped would allow him to disrupt receivers once he gained a more prominent role. The sophomore will be a big part of the defense this fall. 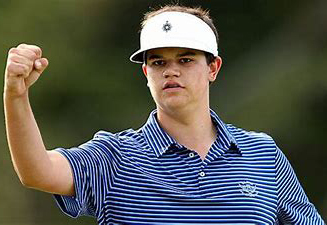 Beau Hossler Finishes 2nd in Houston Open!! What a great performance by our local golf prodigy this week! Beau played an incredible 4 days of golf at the Houston Open only to lose the Championship by a mere 1/2 ball putt on the 18th! Although he lost to a very experienced Ian Poulter in the single hole playoff, Beau showed great maturity and poise during a very great run. Congrats to Beau on a great tournament; many more to come!! 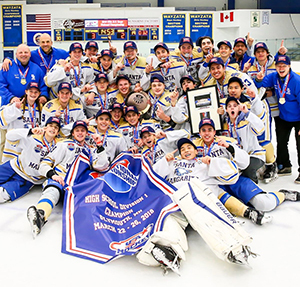 SMCH School Hockey Team Wins Division 1 National Championship!! Thanks to a last minute overtime goal by Leevi Selanne, SMCHS secured their National Championship!! The four-star QB from Tesoro HS in Rancho Santa Margarita had originally committed to Arizona but changed his commitment to UCLA 2 years ago. Now he is the leading candidate to replace Josh Rosen as the starting QB for 2018. Princeton Wins ECAC Hockey Championship with OT Goal From OC Star Max Becker!! Orange County's hockey phenom Max Becker scored the Golden Goal 2:37 into OT against top ranked Clarkson University at the Herb Brooks Arena in Lake Placid, N.Y. Princeton men’s hockey concluded its improbable run to the ECAC championship with an overtime 2–1 victory over Clarkson. Senior forward Max Becker scored the game-winning goal at the 2:37 mark in the overtime period, giving Princeton its first ECAC championship since 2008 and an automatic bid to the NCAA tournament. "Roth’s goal was just the third the Lions have conceded this season." 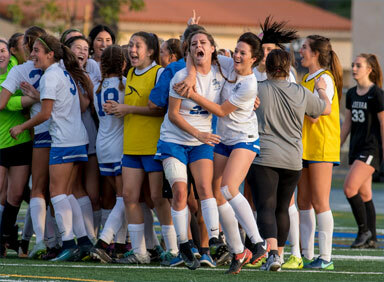 RANCHO SANTA MARGARITA – Knocking off JSerra’s girls soccer team was supposed to be an impossible task this season, but Santa Margarita had a formula to do so, and the Eagles followed it with tremendous verve in Thursday afternoon’s Trinity League title decider. Ramirez is a forward with Minnesota United FC in the MLS. 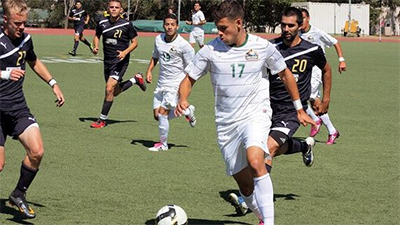 He is currently training daily about 20 minutes away from his hometown of Santa Ana, Calif. and his Concordia University of Irvine soccer team. The 6-2 striker is one of 15 players in MNT camp looking for their first cap. 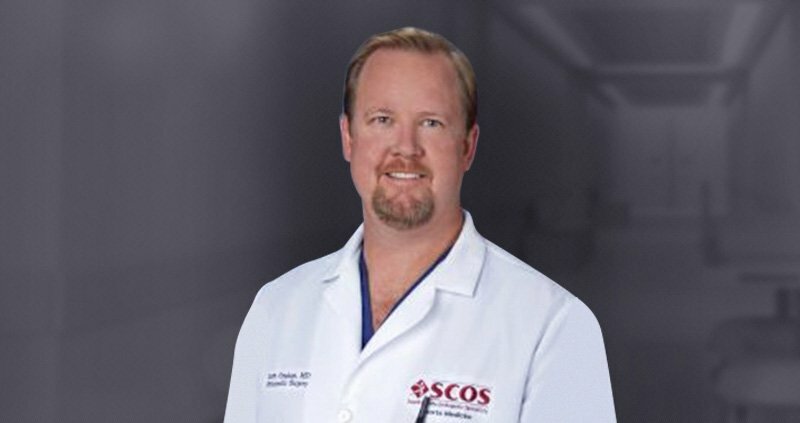 Once again, congrats to SCOS Orthopedic Specialists Sports Medicine Surgeon Dr. Graham on being named one of the Top Doctors in all of Orange County for 2018. 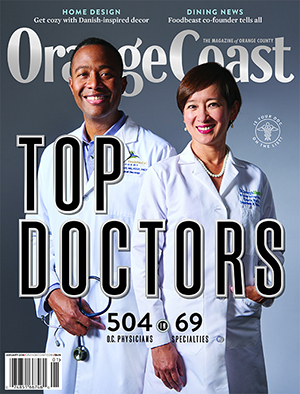 "It is an honor to again be nominated and selected to this group of excellent physicians and included in the list of best orthopedic surgeons in Orange County. Thank you to the selection committee for this honor." 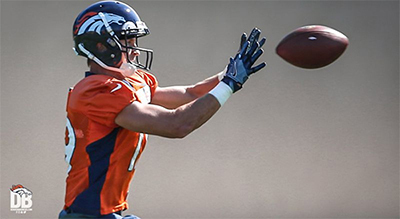 Local SMCHS Football Player signs new contract with the Denver Broncos for 2018!! Congrats River!!! SMHS Girls Volleyball Team Dominates Division 1 Playoffs by winning Title!!! ORANGE – Santa Margarita’s girls volleyball team exploited its height advantage at the net, controlled the ball well and got outstanding play from its back line, leading to a 25-19, 25-12, 25-13 sweep of Logan High of Union City in the CIF State Division I final Friday at Santiago Canyon College. Yes! RB Jeremy McNichols makes the active 49ers roster!! When the Buccaneers drafted running back Jeremy McNichols in the fifth round of this year’s draft, there were some who wondered if a good showing this summer could put him in contention for a role with the team while Doug Martin was suspended to open the year. Stanfords KJ Costello has awesome 4 passing TD's against Notre Dame! Two weeks ago, Notre Dame was on the precipice of a College Football Playoff berth. Two losses in three games later, the Fighting Irish have ended their 2017 regular season with a whimper. K.J. Costello threw four touchdowns and Stanford's defense forced three turnovers as the Cardinal pulled away in the fourth quarter for a 38-20 win Saturday at Stanford Stadium. JP was 15yo in May 2017 when he injured his right knee ACL while cross-training. As an elite hockey player, he and his family were extremely worried about his future. He played for the LA Jr. Kings 2015 U14 team and then in 2016 moved to Minnesota to play at Shattuck St. Mary's for their U16 team as a forward. It was here in the spring that he was injured. He flew back home to see specialist Dr. Scott Graham for evaluation and treatment. He was able to have an MRI that same day, the diagnosis confirmed and a plan formulated. 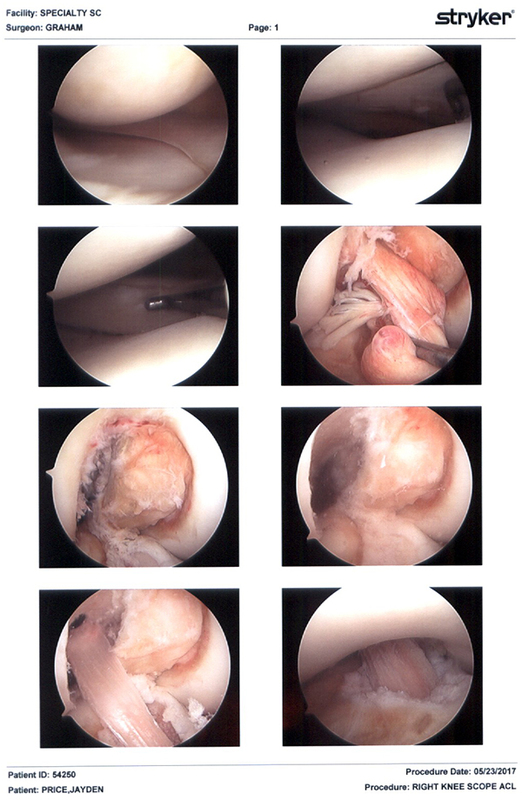 He underwent arthroscopic ACL reconstruction without complications two weeks later. On a progressive protocol, he excelled post-operatively. His physical therapy was with noted skating therapist Chris Phillips at Compete Sports Performance and Rehab. With everyone working together for JP’s full return, he was back on the ice by 2 ½ months focusing on a full recovery and return to hockey. By 5 ½ months, JP was back to playing competitive hockey with his team. Congrats JP on your return!! Shattuck-St. Mary's in Minnesota is the "Hogwarts of Hockey," and being "to hockey what Harvard is to law." In total they have 24 USA Hockey National Championships. The school has also gained a reputation as their players go on to compete at the highest levels of collegiate and Junior League Hockey, and in numerous cases the NHL and the Winter Olympics. #80 Oklahomna Sooners Grant Calcaterra gets 3rd TD reception against TCU as a true freshman! Grant Calcaterra pulls down a 13-yard touchdown pass from Baker Mayfield to give OU a 17-7 lead. Ryan Wolpin is THE MAN on the Blue Turf! He is Boise State’s ‘Tornado’ in the backfield. And his path just made him stronger. If there is any agreed-upon description of what makes a “Boise State guy,” senior running back Ryan Wolpin checks all the boxes. Johnny Stanton leads UNLV over Hawaii with 2 passing TD's. The question throughout the week was who would start at quarterback, and the answer was Johnny Stanton, who provided a dramatic statement for UNLV. He completed 18 of 26 passes for 244 yards and two touchdowns and rushed for a TD, and the Rebels’ defense held off a late Hawaii drive in a 31-23 victory Saturday at Sam Boyd Stadium. River Cracraft signs with the Denver Broncos! Running Back Jeremy McNichols become a 49er! Rookie running back Jeremy McNichols will get a second chance after signing with the San Francisco 49ers practice squad, per Mike Garafolo of NFL Network. McNichols was a 2017 fifth-round pick by the Tampa Bay Buccaneers but struggled during the preseason and was waived during the final round of cuts. He went unclaimed on waivers before signing with the 49ers Sunday. WSU Football player Kyle Sweet does it all! 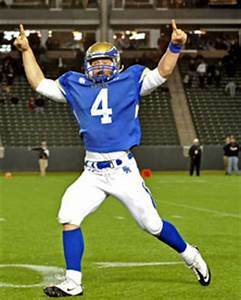 Kyle Sweet was throwing footballs when he arrived at Santa Margarita High School in 2011. By 2012, he was catching them. Now he’s punting them. Throughout his football career, Sweet, a junior at Washington State, has seemingly done everything short of line up at nose tackle. But he’d probably oblige if asked. Dr. Graham wins the top podium position in the SCCA GT3 class at Buttonwillow Raceway this past weekend in his SCOSORTHO sponsored Mazda RX-7!! BOOM! 3* Defensive End Rick Wade Commits to UCLA!! 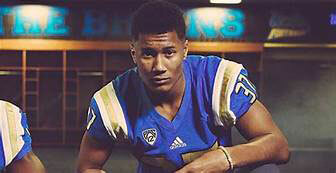 UCLA defensive coaches Adrian Klemm and Angus McClure land a commitment from Rick Wade, a 3* Defensive End from Santa Margarita Catholic High School in Orange County. 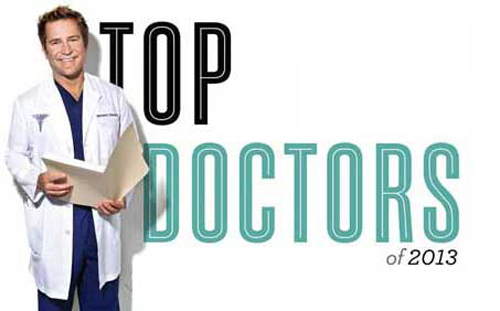 Dr. Graham was selected as one of the Orange County Medical Associations” Top Doctors of 2013 in Orthopedic Surgery as seen in Orange Coast Magazine Jan 2013. The Comeback Kid: Stanton’s rehab is paying off!! "Just heard from Santa Margarita head coach Harry Welch that Johnny Stanton's knee surgery was a complete success today. 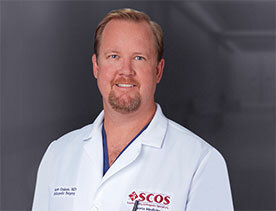 The operation was performed by Santa Margarita Catholic team physician Dr. Scott Graham. Coach Welch said, "in the doctor's words, everything went perfect, Johnny will make a 100% recovering and he'll be as good as new." Four Time Olympic Athlete Wins GOLD!!! 2012 USA Womens H2O Polo Player Heather Petri Wins Gold!!! LONDON — The United States won its first gold medal in women’s water polo, getting five goals from Maggie Steffens and a sterling performance from goalkeeper Betsey Armstrong en route to an 8-5 win over Spain on Thursday. 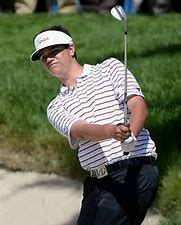 SMCHS Senior Hossler is Killing it in the First Round of the US Open!! He is Beating Woods and Speith!! SAN FRANCISCO – As quick as Tiger Woods grabbed the U.S. Open lead he lost it. To a 17-year-old qualifier, no less. Orange County's own 17yo Nyjah Huston wins 150K winning the opening contest of the Street League Skateboarding tour! KANSAS CITY, Mo. 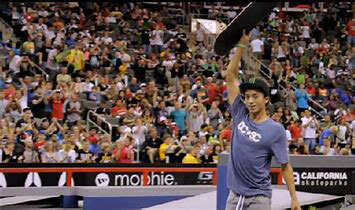 (AP) - Nyjah Huston won the opening contest of the Street League Skateboarding tour and top prize of $150,000. As the college soccer season hits its stretch drive, let's take a look at some of the most dominant players in Southern California this year, no matter the division.